NEW Turn Signal Mounting Brackets for 30mm-37mm Forks. These custom signal light mounts are made of a super durable steel. 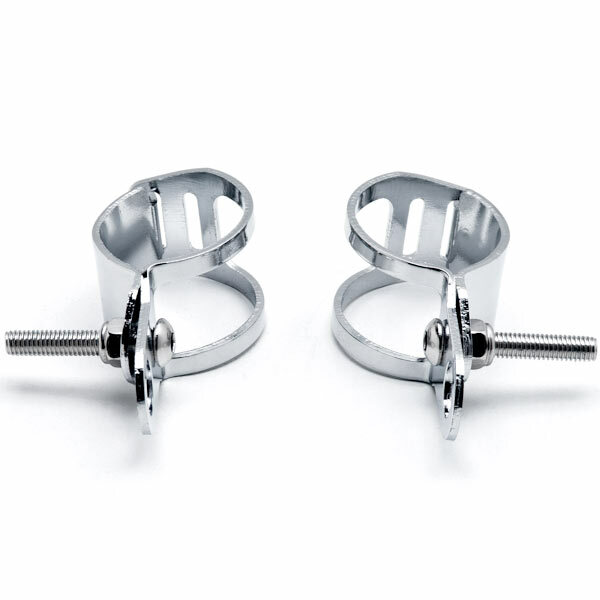 They are fully adjustable to fit 30-37mm diameter fork tubes. From the center of the fork to the center of the furthest hole it is approximately 2 1/2". Turn signal mounting hole is 15/32". Comes with mounting bolts. These are nice quality, sturdy, and simply styled mounts for that custom chopper, bobber or cafe racer. Center of the fork to the center of the furthest hole is approximately 2 1/2"
Turn Signal Mounting Hole Diameter: 15/32"